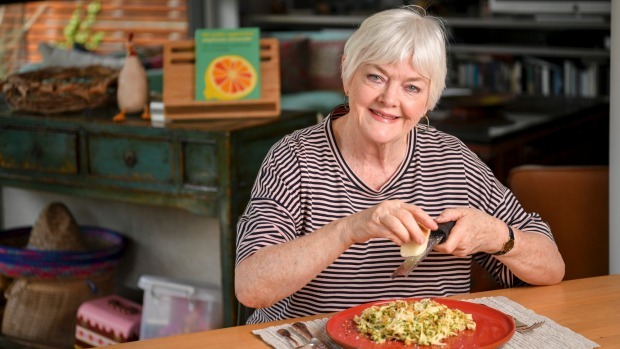 Inspired by the runaway success of her 1996 kitchen bible The Cook's Companion and her work with teaching school children to grow, choose and cook food, Stephanie Alexander returned to the keyboard to write The Cook's Apprentice. "While The Cook's Companion aims to teach adults about the produce in this country, The Cook's Apprentice​ has a particular emphasis on techniques – the 'hows' and 'whys' of cooking," she writes in the book's introduction. She imagined herself talking to young cooks as she wrote each recipe, explaining details, defining ingredients and offering reminders and advice that will demystify the cooking process. But even more experienced kitchen hands will come away from reading The Cook's Apprentice​ with some tips and tricks – including how to handle chillies, pronounce pancetta, cook with alcohol and make a decent salad dressing. These lovely sauces are all perfect to serve with home-made pasta or shop-bought pasta. Do buy a chunk of good parmesan cheese, not a packet of already grated cheese. The difference in flavour is huge. Grate what you need for the dish (maybe 50g for four people) and then rewrap the chunk in a cloth or a waxed food wrapper and refrigerate it for next time. If you are making pasta for lunch or dinner, remember the rule: have everything prepared before you start. Table set? Check. Cheese grated? Check. Herbs chopped? Check. Colander in the sink? Check. Salad in the salad bowl? Check. Pasta bowls warming in a low oven? Check. Great! You are ready to start. 1. If your tomatoes are large, halve them and squeeze out the seeds, then dice. Or use halved cherry tomatoes. In a pan over medium heat cook the onion and garlic in the oil for a few minutes. Add the tomato and basil, then season and toss together. Raise the heat and cook until the tomato has collapsed and the juices look syrupy. Taste for salt and pepper. Spoon over hot pasta in warmed bowls and offer parmesan. 1. In a frying pan over medium heat melt the butter. Once it has just started to foam drop in the rocket leaves and turn them in the hot butter for no more than one minute. They should just wilt. Tip in the cooked and drained pasta, remove the pan from the heat and add pepper and a little salt. Gently toss, then serve in warmed bowls and offer parmesan. 1. In a frying pan over medium heat melt the butter and add the oil. Drop in the anchovy fillets and stir until they start to melt. Add the onion and stir to coat with the buttery juices, then cover and lower the heat. Cook for about 10 minutes. 2. Uncover, then raise the heat for the final stir, add the parsley and season. Toss through hot pasta, then serve in warmed bowls and offer parmesan. 1. In a frying pan over medium heat, stir the oil, garlic and chilli for one minute. Add the anchovies, olives, capers, tomato and oregano, then stir, and simmer for 10 minutes. Taste for seasoning and spoon over hot pasta in warmed bowls. Garnish with parsley and offer parmesan. 1. In a frying pan over medium heat melt the butter with the oil. Cook the onion and garlic for two minutes. Add the mushrooms and water, then cover the pan and cook for eight minutes until the mushrooms have shrunk in the pan. Uncover and raise the heat to high to boil away some of the juices. Add the cream and taste for salt and pepper. Add the parsley and toss through hot pasta. Served in warmed bowls and offer parmesan. 1. Soak the currants or sultanas in hot water for 10 minutes. In a frying pan over medium heat cook the onion, garlic and chilli in the oil for one to two minutes. 2. Add the silverbeet and drained currants. 3. Turn to mix the silverbeet in the juices. Cook for five minutes, then stir in the pinenuts and cheese. Toss through hot pasta and serve in warmed bowls. Offer parmesan. 1. Lightly beat the eggs in a small bowl and stir in the parmesan and parsley. Heat the oil in a frying pan over medium heat. Add the pancetta and cook for two to three minutes until crisp. Toss the pancetta through the hot pasta. 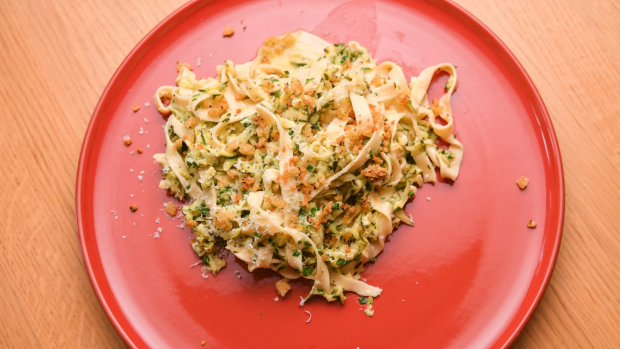 Quickly stir the egg, cheese and parsley mixture into the pasta, serve in warmed bowls and finish with pepper, more parsley and extra parmesan. 1. In a frying pan over medium heat melt the butter and cook the sage leaves until crisp (about three minutes). Remove the sage leaves to a plate, then add the oil, garlic, zucchini and zucchini flowers. Cook, stirring occasionally, until the zucchini have become a little golden and the flowers are golden-brown. Add the zest, juice and ricotta. Lower the heat, cover and cook for two to three minutes. Meanwhile, add the peas to the pasta for the last few minutes of the cooking time, then drain. 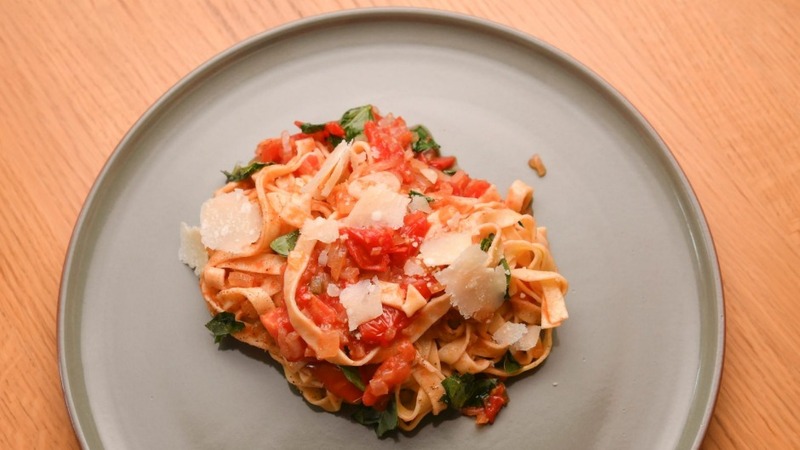 Spoon the sauce over hot pasta in warmed bowls, top each portion with three crisp sage leaves and offer parmesan. This is one version – there must be thousands! From pantry to table, this will take about one hour and 45 minutes. 1. Cook the onion, celery and garlic in the oil in a large saucepan over medium heat until softened, about 10 minutes. 2. Add the minced meat and pancetta or bacon and cook until the meat breaks up into small lumps. You will need to encourage this by squashing the lumps of meat with a wooden spoon (I use a potato masher!). 3. Sprinkle in the flour, then stir well. Add the wine and some salt, pepper and nutmeg. Mix well, then increase the heat and bring to a boil to reduce the liquid. You need to cook the sauce until it looks moist but is not sloppy. 4. Now add the stock or tomato juice, tomatoes, tomato paste, cream and herbs. Mix well. Reduce the heat again and simmer for one hour, stirring from time to time. Taste for seasoning. Variation: You could leave out the wine and substitute water. Or you could use red wine instead of white wine. ■ Different pastas suit different sauces. The general rule of thumb is that thick, chunky sauces are best with angular, tubular or twisty pasta. And that creamy sauces or simple oil-and-herb dressings are best with strands. ■ Select a pot that can hold at least eight litres of water. The rule is one litre per person and one litre for the pot and enough room for fast boiling. Add one tablespoon of salt per four litres of water. 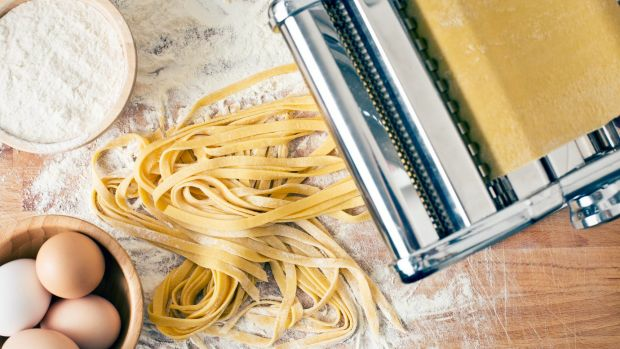 ■ Fresh pasta will take two to three minutes. Dried pasta will take five to 12 minutes, depending on the shape and thickness. Follow the instructions on your packet. ■ A minute or so before the end of the cooking time, test the pasta to see if it is "al dente", which means "to the tooth" in Italian. When you taste it, the pasta should not be too soft nor too hard and there should be a little resistance. ■ Drain the pasta in the sink. NEVER rinse it – the precious sauce-catching starch left on the pasta disappears down the sink if you do. It is always a good idea to spoon out a couple of tablespoons of the cooking water moments before you drain the pasta in case you need to thin a sauce or help a thick sauce such as pesto blend evenly with the hot pasta. 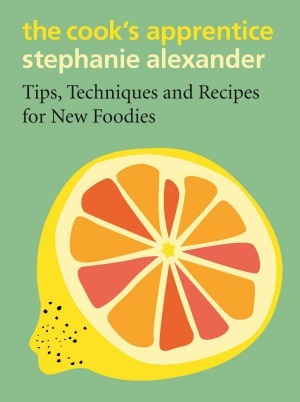 This is an edited extract from The Cook's Apprentice by Stephanie Alexander, published by Lantern, RRP $45.